Goddess. Serena, while you are in phenomenal physical shape, you must be aware that you are at risk for developing pre-eclampsia because this is your first pregnancy and are 35 years old. Pre-eclampsia is also sneaky and doesn’t make a grand announcement. Some of the symptoms include, having a headache that doesn’t go away even after taking acetaminophen, blurry vision, rapid weight gain in one week (because of increased fluid) and having high blood pressure after 20 weeks. 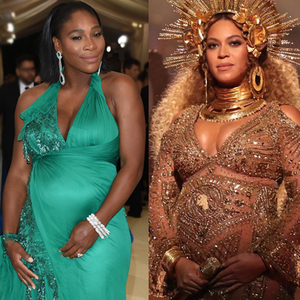 The Queen and Goddess are both African American, therefore the risk of having a pre-term delivery is greater. While pregnancy is a beautiful thing, it’s not always peaches and cream. It’s more like an airplane ride that can encounter some rough air and bumps. The purpose of writing this blog is to help you navigate your pregnancy to a safe and healthy delivery.